We are looking at how God invites us to ‘come up here‘, how He invites us to experience for ourselves the realms of heaven. Now I am only telling you about the places I have actually been myself, so that I can give you testimony from first-hand experience, and tell you that it is possible to go there. There are plenty of other places where I haven’t been. And I find that when God gives me experiences, sometimes it is only later on that He brings revelation of where those places are. So there are also places which, although I have been there, I couldn’t tell you where they are as yet. But you don’t just have to take my word for all this. I’m going to give you a lot of scriptures this week. I know that some of you will have been saying, ‘where in scripture does it say we can do this?’ And if you don’t believe you can go there, and don’t know what the Bible says about it, then you are never going to get there. If you know that this is all scripturally based, then you can have the confidence to enter in. Use these scriptures as a doorway. Go through, and find for yourself the reality of what you read: your experiences can then become an anchor for more. And from Jesus Christ, the faithful witness, the firstborn of the dead, and the ruler of the kings of the earth. To Him who loves us and released us from our sins by His blood (Rev 1:5). Who are the ‘kings of the earth’? We are. At least, we are supposed to be. We are supposed to be manifesting the kingdom of heaven on the earth. Here we have the kings of the earth again, this time opposing Christ. So here the kings and the rulers are not us. In this passage the disciples are quoting from the Old Testament, and it refers to a time before the cross. These are the rulers in the heavenly realms, principalities and powers, who gathered to oppose Jesus. They were trying to destroy the seed, and they did all they could to achieve that, but He overcame them. And no-one in heaven or on the earth or under the earth was able to open the book or to look into it (Rev 5:3). And every created thing which is in heaven and on the earth and under the earth and on the sea, and all things in them, I heard saying, “To Him who sits on the throne, and to the Lamb, be blessing and honour and glory and dominion forever and ever.” (Rev 5:13). God’s throne is above all these other realms. Blessed be the God and Father of our Lord Jesus Christ, who has blessed us with every spiritual blessing in the heavenly places in Christ, just as He chose us in Him before the foundation of the world, that we would be holy and blameless before Him. In love (Eph 1:3-4). It is ‘in the heavenly places’ that God has blessed us with every spiritual blessing. Plural, ‘places’, speaking about more than one place in the heavens. And, ‘just as He chose us in Him before the foundation of the world’: it was always God’s intention that we should rule the realms of heaven, and bring that rule onto earth – that we would access both realms. So when Jesus came, He accessed both realms. If you read Genesis 28, where Jacob had a dream of a ladder, and a door open in heaven, you’ll see that God was standing in the doorway welcoming people in. That ladder did not go through those other realms, by the way. It is not linear, as though you have to go through one to get to two to three to four to five and so on. It goes straight in. We can have access straight in to the realm of Heaven, because that is where our thrones are. He made known to us the mystery of His will, according to His kind intention which He purposed in Him with a view to an administration suitable to the fullness of the times, that is, the summing up of all things in Christ, things in the heavens and things on the earth. In Him also we have obtained an inheritance, having been predestined according to His purpose who works all things after the counsel of His will (Eph 1:9-11). We now live in a time when that administration is being outworked through us, the kings. That administration is our inheritance. God has already purposed this: we have to work it out. And we can’t do it from our position here on earth. We have to go into the realms of the heavens to outwork it, because that is where the authority structure is which will enable us to bring it here on earth. Up to now, the church has been trying to change things in the atmosphere of the earth from our position here in this earthly realm. We have talked about ‘praying into those realms’, whereas in fact we need to go into higher realms, realms above the atmosphere of the earth, and exercise authority from those higher realms to bring about the changes we desire. Look back at the first diagram I shared at the beginning of this series. We have authority from those three realms going into heaven, and the realm of Heaven. That authority is what enables us to go into the atmosphere of the earth, to break the enemy’s power, and to reclaim it and purify it. It is our inheritance. He has stolen it, or rather, Adam handed it over to him; but because of the cross, we can get it back. And raised us up with Him, and seated us with Him in the heavenly places in Christ Jesus (Eph 2:6). 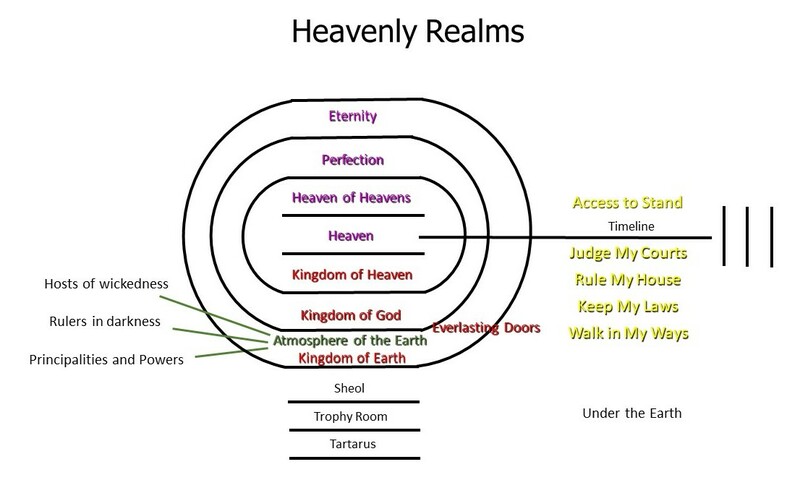 Again, if we read carefully we can see that this tells us there are lots of heavenly places, and lots of thrones where we are seated. We have to get hold of where they are, and be sure we are seated on them. Now this expression, “He ascended,” what does it mean except that He also had descended into the lower parts of the earth? He who descended is Himself also He who ascended far above all the heavens, so that He might fill all things (Eph 4:9-10). If He descended to the lower parts of the earth, and we are supposed to do the works that He does, and did, then what are we supposed to do? The lower parts of the earth are also realms where we should be ruling. I am not talking about Jules Verne, Journey To The Centre Of The Earth. I am not talking about physically going down into the earth, although it is described in those terms. These are really spiritual realms of government and authority. The centre of the earth contains a throne on which Adam would have ruled in glory. It also says that Jesus ascended. So everything in all of those realms is supposed to be filled with the glory of God. And to bring to light what is the administration of the mystery which for ages has been hidden in God who created all things; so that the manifold wisdom of God might now be made known through the church to the rulers and the authorities in the heavenly places. This was in accordance with the eternal purpose which He carried out in Christ Jesus our Lord (Eph 3:9-11). God’s manifold, multi-faceted wisdom is to be made known through the church, through us, to the rulers and authorities in the heavenly places. That is His eternal purpose. He has always intended that it should be this way. One God and Father of all who is over all and through all and in all (Eph 4:6). We need to get hold of this truth, because it will explain why we can go to any of these realms, to all these heavenly places. It is because God is in it all, and we are in Him. I want to encourage you to take these scriptures, meditate on them, ask God to take you to these places and show you the reality of all this. This is your inheritance. You can have access to it all.